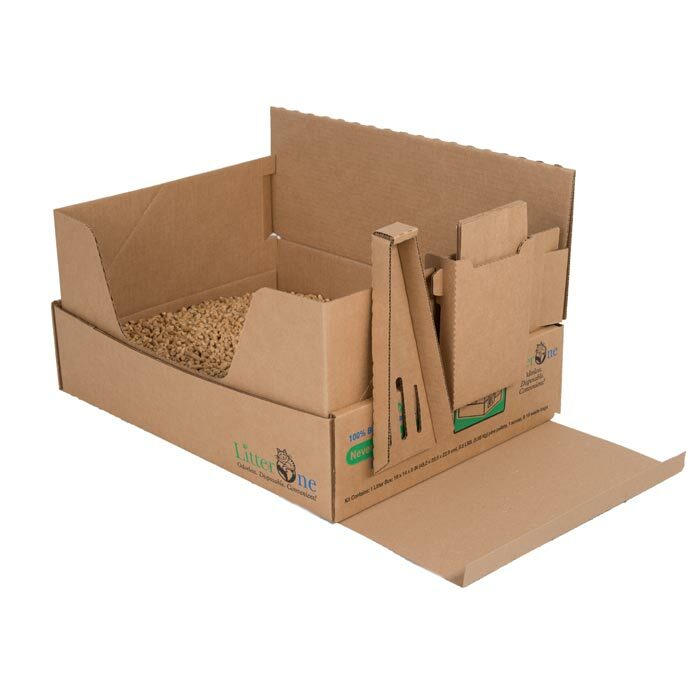 Litter One Cat Litter Kit Brown 19" x 14" x 9"
Cats are naturally clean animals, so why not provide them with a naturally clean alternative to their current litter box? 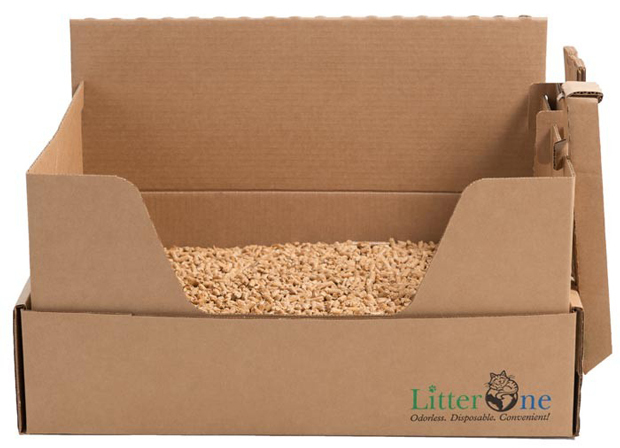 Litter One offers the only 100% Biodegradable Cat Litter solution that comes to your door complete. Your product will arrive in a protective shipping carton made from post-consumer recycled material. Each litter box measures: 19" x 14" x 9" sides; front opening = 4.5" H x 11" W and contains 8.5 lbs of Pine Pellet Litter. 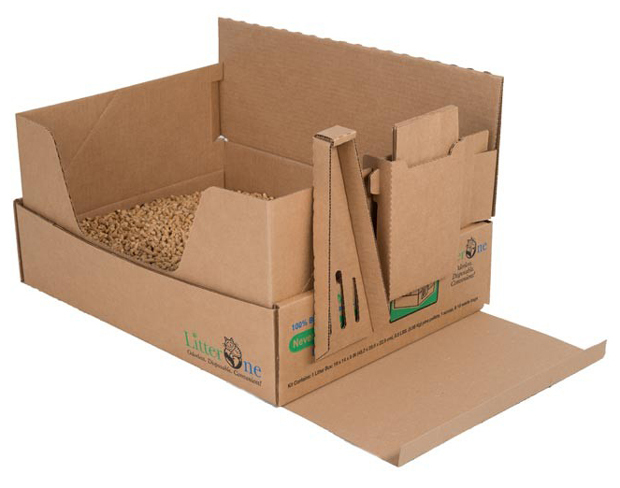 Litter One kits are equipped with a patented method for the removal of cat urine from a litter box. 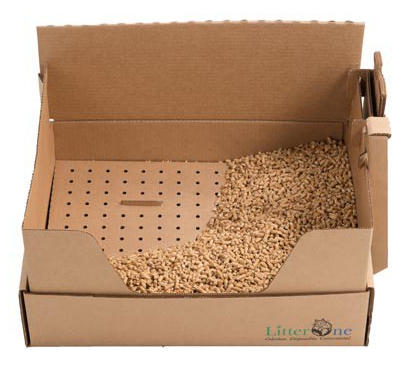 The unique manufacturing process of the all Natural Pine Pellets used in Litter One kits allows the pellets to dissolve into sawdust when they come in contact with urine. Litter One's patented "False Floor" allows the sawdust to fall through the perforated false floor. This effectively makes scooping cat urine a thing of the past!! It also keeps your cat from stepping on soiled litter and provides a cleaner, happier home for both you and your pet. You will receive One Complete Litter One cat care litter system made from recycled materials and which are also 100% Biodegradable. 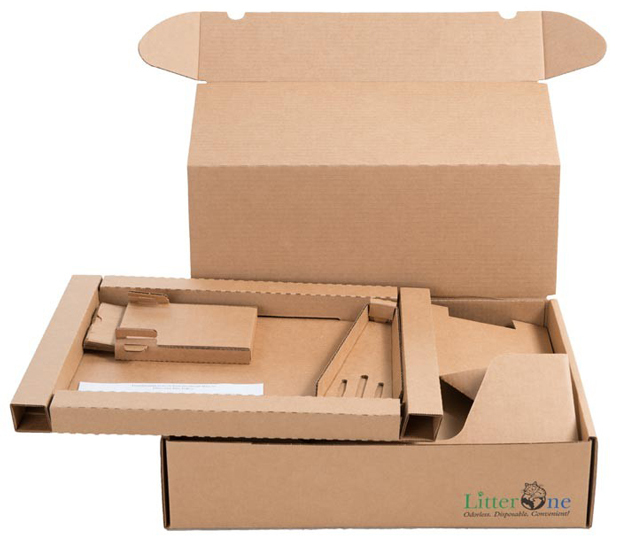 The Litter One kit’s components are designed to breakdown quickly to protect the environment. Each litter kit contains a disposable scoop and disposable waste bags. The harmful effect of clay litter on cat health has always been a controversial subject. Traditional clay cat litters basically come in two forms, non-clumping and clumping. Non-clumping cat litter is often made of zeolite, diatomite and sepiolite. Clumping clay litter is mostly made from granulated bentonite clay which clumps together when wet and forms a solid mass separate from the other litter in the box. To help control the smell of urine, in most clay litter, chemical freshening agents are added. However, clay litter can be unsafe for cats’ respiratory systems and the mining required to dig up the clay contributes to mass losses of vegetation. Litter One’s Pine Pellet cat litter absorbs urine leaving a fresh pine scent and is 100% Safe for kitty. Unlike traditional clay litters, the Litter One pine alternative is better for the environment and for cats. 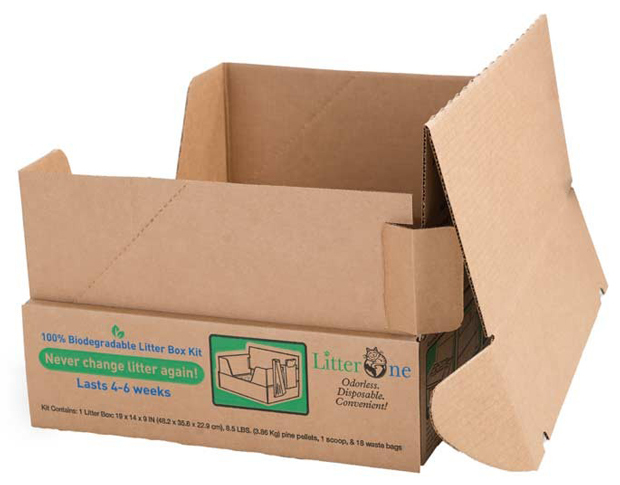 Litter One is made from 100% Natural Pine and has no chemical additives. Litter One’s entire product line is manufactured from materials and produced through vendors who support key global initiatives in proper forest management and harvesting. These members belong to FSC (Forest Stewardship Council) and SFI (Sustainable Forest Initiative). Litter One’s Pine Pellet Litter: Pine pellets break down in less than two years leaving no environmental impact. Litter One products decompose and do not contribute to landfill waste. 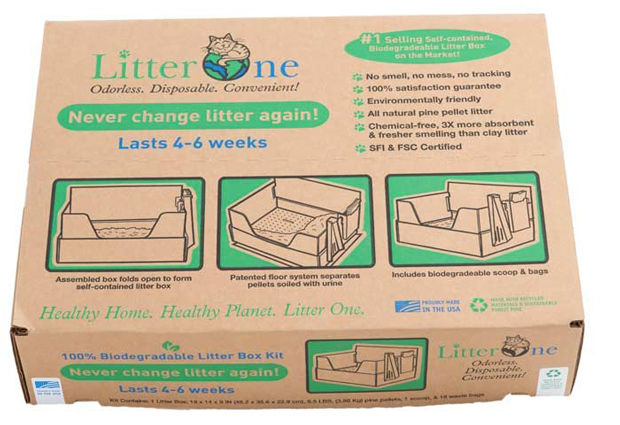 Litter One's product is 100% eco-friendly and 100% safe for cats. Dimensions: 19" x 14" x 9"
19" x 14" x 4.5"